In 1961, Hughes was one of the twelve companies that submitted proposals to meet U.S. Army TS-153 requirement for a four-seat turbine-powered light observation helicopter. Model 369 was developed and flew first on 27 February 1963. Five machines of this type were ordered as OH-6A for the evaluation programme. The OH-6A Cayuse powered by an Allison T63-A-5A turboshaft was the winner of the U.S. Army's contest in May 1965. Deliveries commenced in September 1966 to meet an initial three-year commitment for 1071 machines. Next to the military OH-6A Hughes developed a larger, five-passenger civilian version. Initially designated as the 369H and 369A during the development stage, it emerged on the market as the Hughes 500. In 1968, the 500C with the more powerful Allison 250-C20 engine was introduced. In 1977, the 500D entered the market with a new five-bladed rotor system and the Allison 250-C20B engine. In 1982, Hughes introduced both the 500E with the Allison 250-C20B and the 530F with the more powerful Allison 250-C30 engine. On 6 January 1984, Hughes Helicopters became a subsidiary of McDonnell Douglas, and subsequently re-designated the McDonnell Douglas Helicopter Company. The Hughes 500 thus became the MD500. 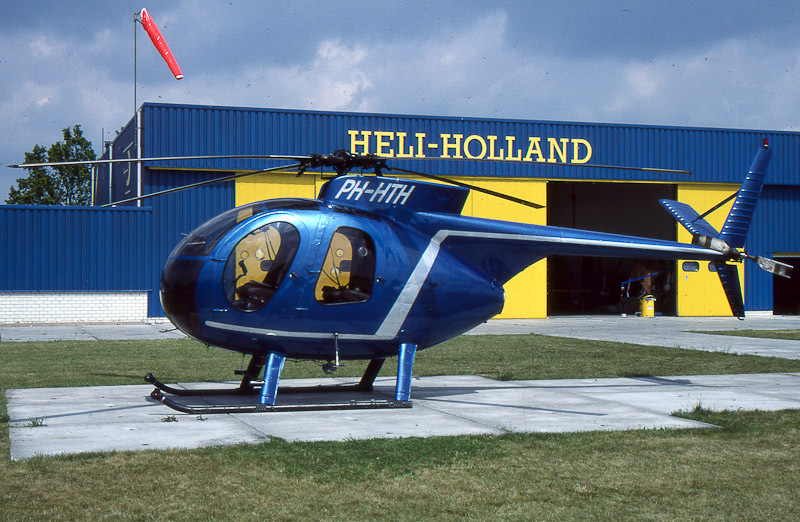 On 15 June 1990, Hughes 369HS c/n 53-0478S was registered PH-HTH in the Netherlands with Heli-Holland Holding B.V., Emmer-Compascuum. Before entering the Dutch register, the 1973-built aircraft was registered in the USA as N9143F. Hughes 500 PH-HTH was operated by Heli-Holland until 2004. In 2004, the PH-HTH was sold in New Zealand and left Emmen on delivery to the new owner on 4 August 2004. After the registration PH-HTH was cancelled on 12 October 2004, the Hughes 369HS was registered ZK-HOM in New Zealand with Mr M J W M Wouters van den Oudenweijer, Maunganui, on 26 October 2004. The owner operated the ZK-HOM out of Tauranga, at the North Island of NZ. On 28 July 2005, the aircraft was transferred to Mr C Carlsson, Coromandel. On 6 June 2006, the Hughes 369HS ZK-HOM was registered with Vertical Aviation Ltd, Christchurch.